Be the first to share your favorite memory, photo or story of Jeanne. This memorial page is dedicated for family, friends and future generations to celebrate the life of their loved one. 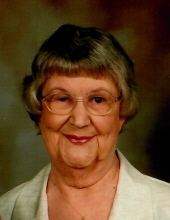 - Jeanne M. (Halter) Burke, 88, passed away Friday, March 29, 2019 in St. Antoine Residence, North Smithfield. She was the wife of the late Philip A. Burke. Born in Carbondale, PA, she was the daughter of the late Martin and Loretta (Titus) Halter. Jeanne worked as a secretary at Zambarano Hospital for 15 years. She is survived by a son, Philip Burke Jr. of Newport; two daughters: Peggy Tancrede of Glendale and Eleanor Jeanne Beauchesne of Ashburn, VA; five grandchildren and seven great grandchildren. She was predeceased by a son, Michael Burke and two sisters: Eleanor Gratch and Doris Teimer. Friends and family are invited to attend her Mass of Christian Burial on Wednesday, April 3, 2019 at 11 AM in St. Patrick’s Church, 45 Harrisville Main St., Harrisville but request no flowers be sent. Burial will be private. Calling hours are omitted. Arrangements are under the direction of the Boucher Funeral Home, 272 Sayles Ave, Pascoag. To send flowers or a remembrance gift to the family of Jeanne M. Burke, please visit our Tribute Store. "Email Address" would like to share the life celebration of Jeanne M. Burke. Click on the "link" to go to share a favorite memory or leave a condolence message for the family.